Brilliant 22 degree Moon halo captured during an Ursid meteor shower watch on Dec 22/23rd 2007 from a country location outside Maghera. With the naked eye the halo was extremely bright with vivid yellow and white colours in a 70% complete circle. A short-lived upper tangent arc was also seen. The Moon was almost full and high in the eastern sky within Taurus. Perseus can be seen above and the halo itself covers comet 17P/Holmes which can faintly be seen. 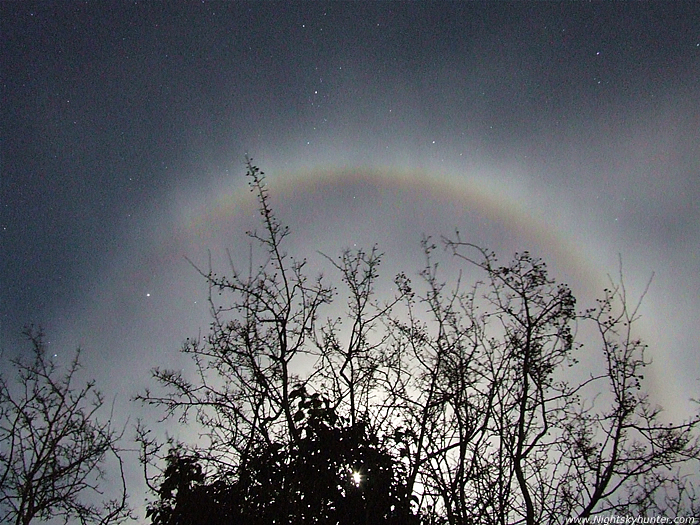 This halo was a glorious sight on this freezing, frost coated and very festive night before Christmas. I used a row of tall trees to subdue the intensity of the lunar glare.